Assorted Notions: I *love* a bargain! Last night I put in a small order at Fashion Fabrics Club to take advantage of the $1.95 shipping offer that expires today. I got some yellow/black/white floral silk chiffon that I am intending to use for a specific dress project. 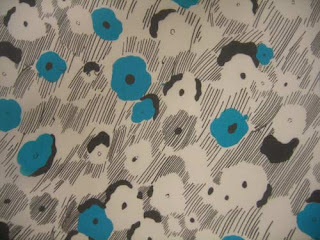 Then I remembered a similar blue/black/white floral silk chiffon that I had been admiring at Fine Fabrics. It is described as being made for Anna Sui and cost 4x what the FFC fabric cost. Hi! I just happened to find your blog posted on someone else's site. This will be great fun. I will add your site to my listings. I still intend to make the skirt from Patrones--from the issue you sent me last fall. Probably for next fall. I shop at fashion fabrics club too and love them. What a great deal you got!! !